This commercial-grade canopy's durability comes from the sturdy beam welded 2-inch diameter steel frame that goes through a 13-step Rhino Shield preparation process and is bonded with a DuPont thermoset baked-on finish. 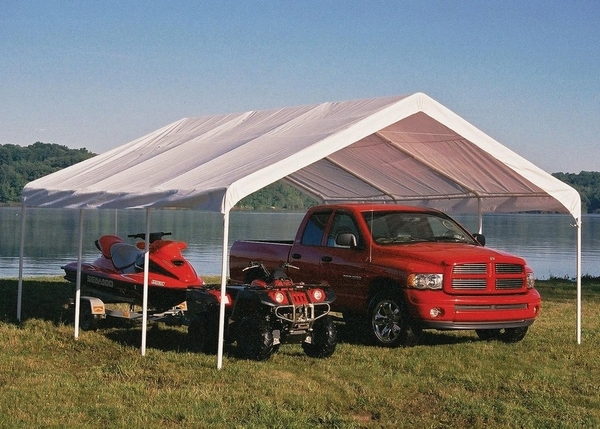 This increases the tent frame's strength and eliminates rust, weathering, chipping, or peeling. The one-piece, full valance cover is UV treated to prevent fading, aging, or fungus, it is totally tear-resistant, and it is made of 100% waterproof polyethylene. The cover twists tight to secure it to the frame wrinkle-free. The frame, in turn, clamps tight to ensure the canopy is square. The wide base foot pads at the bottom of each leg and the temporary anchors give you extra assurance that your shelter logic 18-foot by 20-foot will be secure. It has a 10-year life expectancy. 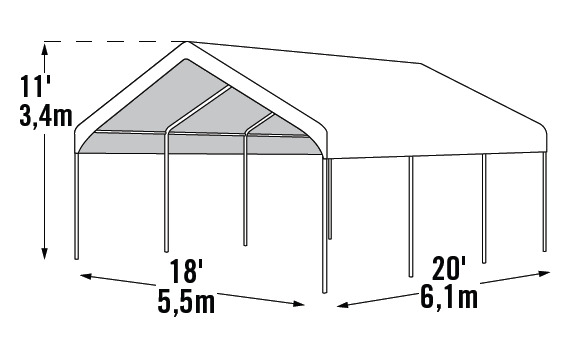 Do you sell a replacement canopy? Mine was damaged. Can I buy just the back of a canopy? Seams are comming apart and had it less than six months, has separated in corner. Was easy to put together. Was very happy with the canopy. It assembled quickly and easily and good value for the money. It withstood Hurricane Sandy yesterday without major damage. We did have it anchored at each base location and with the optional anchor kit and it survived at least 50 mph wind gusts here in MD if not more. ProsEasy to assemble with a few extra hands. ConsDirections could have been a little clearer on exactly where the bolts should have been installed, but it wasn't that hard to figure out either.